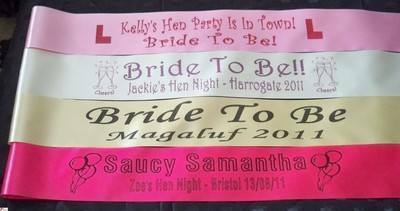 Personalised sashes, great for special birthdays, hen parties, baby showers, leaving parties or even Race for life. 2 metres of 10cm wide ribbon personalised with your own message which is printed on the front and the back of the sash. PICTURES AVAILABLE TO ADD: Hearts, L-plates, champagne glasses, balloons, presents, special age numbers (18, 21, 40, 50, 60). Each sash also comes with a small piece of velcro to fasten the sash together. Please choose from the freetext boxes below your COLOUR OF SASH, COLOUR OF WORDNG, the PERSONALISATION you would like and which PICTURE image you would like added.